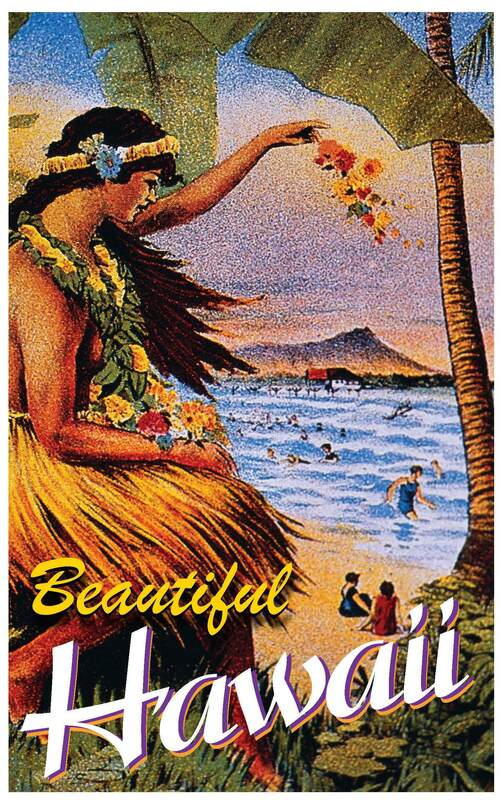 AAA boosts travel to Hawaii with nostalgic effort for Pleasant Holidays. Using an illustration filled with nostalgia, the prospective customer is reminded of the old days when Hawaii was the ultimate getaway. This makes them want to go all the more. Hawaii never looked fresher or more nostalgic than it did in this postcard promotion for Pleasant Holidays, done by my studio for AAA Travel, Northern California. This is a client with great ideas and interest in breaking out of the box, but also dedicated to solid direct marketing principles so that they have measurable success when they mail a promotion. The picture side of the card was adorned with an image that bespoke the old days of Hawaii when the idea of going there was like a seductive siren’s call to Haoles on the mainland. A highly personalized message/mail side boosted the effectiveness of this oversized card, with a casual attitude that reminded the reader of the fun they could have once they traded in their dress shoes for flip-flops. The production and personalization was done by Brian Schott’s company, AdMail, in Hayward CA, who posesses remarkable capability. We were delighted to see how well this card performed, and had even more of a surprise when a friend of mine told me she’d recieved a beautiful card for Hawaii in the mail — and it turned out that it was this one. She had posted it on her bulletin board!